Unless you have a very small Novell Vibe site, you create Vibe users by synchronizing their user information from an LDAP directory service such as Novell eDirectory or Microsoft Active Directory. IMPORTANT:For a large Vibe site with thousands of users, the synchronization process can consume substantial server resources and can take some time to complete. Perform the initial import from the LDAP directory at a time when this processing does not conflict with other activities on the server. If the LDAP server requires a secure SSL connection in order to access the directory service, create a public key certificate for the Vibe server. For instructions, see Securing LDAP Synchronization in Site Security in the Novell Vibe 3.4 Administration Guide. Under System, click Configure LDAP, then click Add a New LDAP Source to add an LDAP directory as a source for synchronizing user information. IMPORTANT:You can add multiple LDAP directory sources. However, do not add a new LDAP source to be used as a failover support for an LDAP directory that you have already specified. Click Apply to save the information and settings. Select Run Immediately, then click Apply to test LDAP synchronization. A status box displays the users and groups that have been added, modified, or deleted on the Vibe site. IMPORTANT:If you used an LDAP user attribute of uid and some users were not synchronized from the LDAP directory to Vibe, repeat the procedure and use cn instead of uid. The usernames admin and guest are reserved for use by Vibe. If your LDAP directory includes users with these names, LDAP information for these reserved usernames is not imported into the Vibe site. 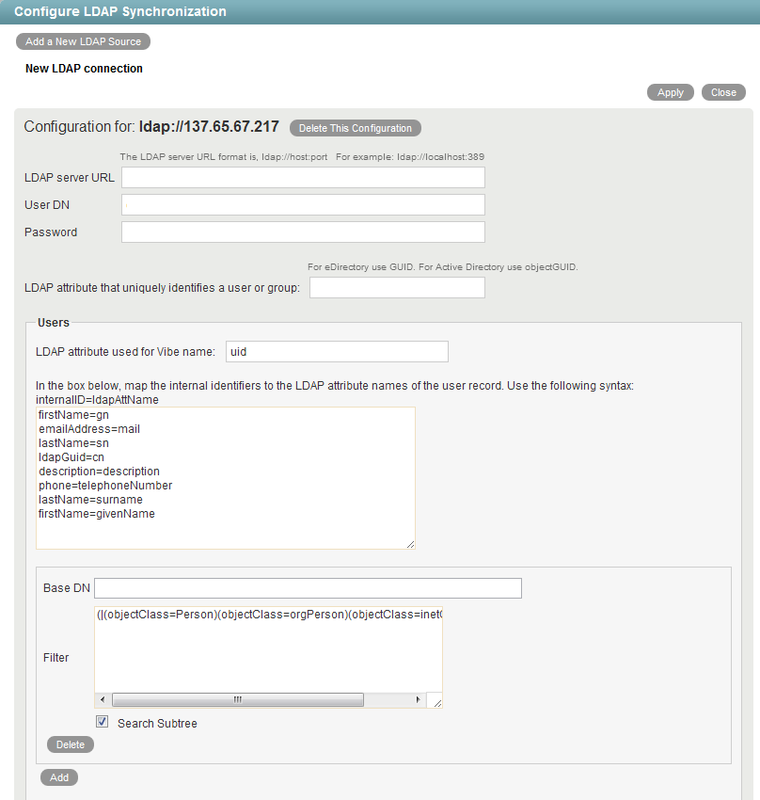 Click Close to close the status box, then click Close to close the Configure LDAP Synchronization page. Vibe performs one-way synchronization from the LDAP directory to your Vibe site. 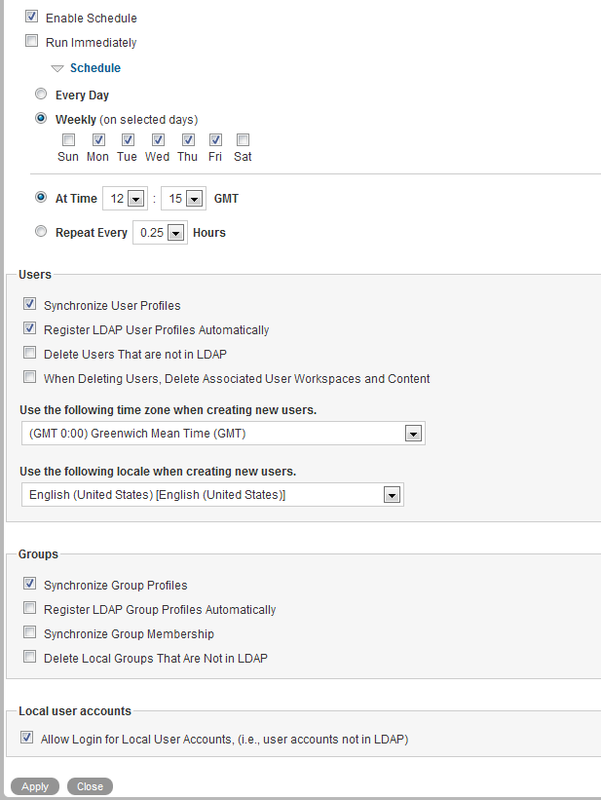 If you change user information on the Vibe site, the changes are not synchronized back to your LDAP directory. IMPORTANT:At this point, users could log into the Vibe site by using their eDirectory or Active Directory usernames and passwords. However, you should not invite users to visit the Vibe site until after you have finished setting up the Vibe site, as described in Site Setup in the Novell Vibe 3.4 Administration Guide.